It is the beginning of a new year, and I am delighted that we are starting our developmental journey in 2018, with a joint project, which is one of the most shining examples of the India-Sri Lanka friendship, the expansion of 1990 Emergency Ambulance Service nation-wide in Sri Lanka, under an Indian grant assistance of US$ 15.02 million. This was announced by Prime Minister Narendra Modi, during his landmark visit to Sri Lanka, in May last year, as the Chief Guest of the UN Vesak Day celebrations. Today, we see the fulfilment of a dream.. a commitment transformed into reality.. one of most notable illustrations of success of a Public - Private Partnership model. There is nothing more noble, than saving human life; it is most satisfying to note, that we are able to assist our dear Sri Lankan brothers and sisters, in this endeavour. Firstly, it is purely a grant project. We launched the Emergency Ambulance Service, more than a year ago, in July 2016 to be precise, in Western & Southern Provinces of Sri Lanka under an Indian grant of around US$ 7.56 million. 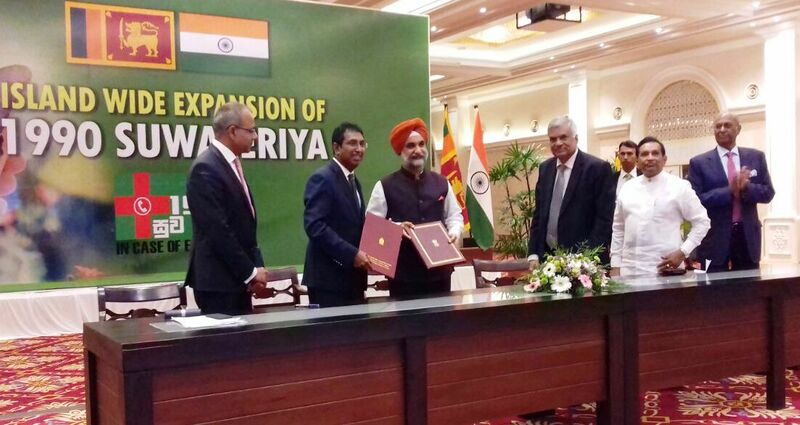 Today, we have reached an Understanding, for a further Indian grant assistance, of US$ 15.02 million for extending the Service, to all other Seven Provinces of Sri Lanka. 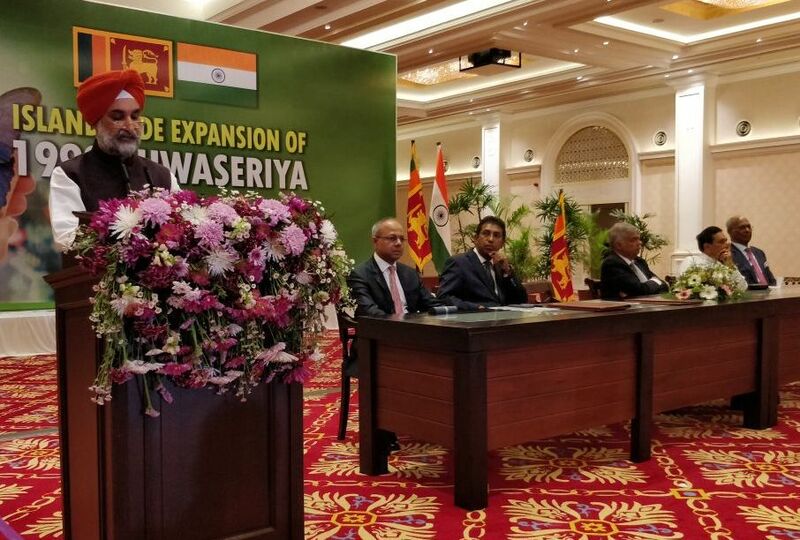 Secondly, as Prime Minister Narendra Modi mentioned, in his video message during the launch of the Service, in July 2016, this is an example of how India joins hands with its dear and near partner, Sri Lanka to cooperate on projects, based on Sri Lanka’s own choices, and priorities for development. We are meeting your aspirations. We are here to help, you achieve your goals. Thirdly, the project is not just about purchase of ambulances and their usage. It is about use of technology for transforming lives, around us. 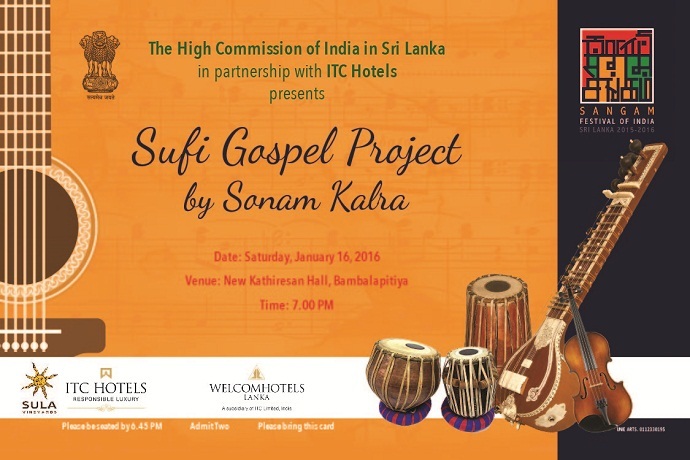 Through this project, we are bringing new technology and best practices to Sri Lanka. GVK is here today, and they have demonstrated their ability, to replicate success stories of India in Sri Lanka. I take this opportunity to wish them, the very best in their continued efforts. Fifthly, we are extremely pleased with the commitment from Government of Sri Lanka and its leadership, to ensure sustainability of the project. 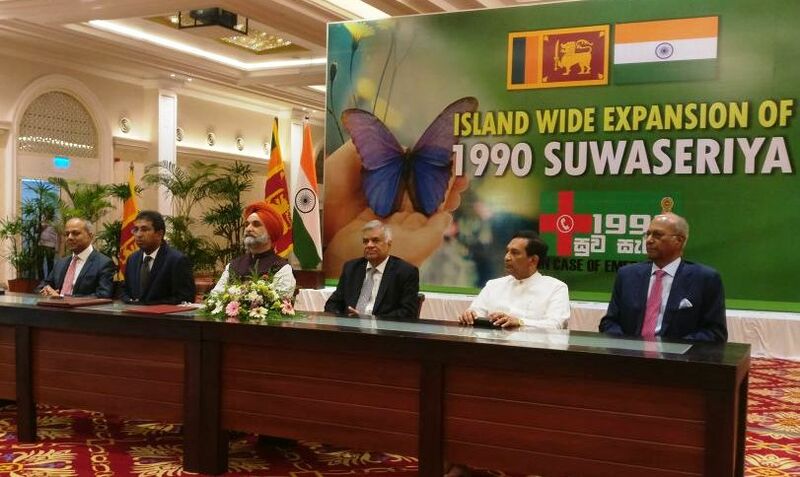 Excellencies, you have put in mechanisms in place, so that this project ‘survives’, and is thereby able to ensure, ‘survival’ of precious lives of Sri Lankan citizens. Your nourishment of the project, is critical in future, which you have already so well demonstrated, in the Western and Southern Provinces. Lastly, I want to underline, the aspect of importance of looking objectively, at issues. The future of our two great nations, is built by leaders, who look ahead; it is built by leaders, who are passionate about their goals. If we are determined to achieve success, nothing can stop us, from reaching our goal. All we need is, the determination to grow together. Let me say it loud and clear, India has only one agenda, in Sri Lanka, that is, to cooperate and collaborate with Sri Lanka, on issues of mutual interest. For us, bilateral cooperation is, all about sharing and caring. It is gratifying to note, that our cooperation in health sector has strengthened, in recent years. Excellencies, you would recall the inauguration of a new District Base Hospital in Dickoya, in May last year, built under Indian grant assistance, in presence of Prime Minister of India, Narendra Modi, President of Sri Lanka H.E. Maithripala Sirisena and Prime Minister of Sri Lanka Hon’ble Ranil Wickremesinghe. We have also gifted the construction of a hospital in Vavuniya; and provided medical equipment to Hospitals in Jaffna, Kilinochhi and Mullaithivu. These are important milestones in our bilateral relations. It was Lord Buddha who said, “Thousands of candles, can be lighted from a single candle, and the life of the candle, will not be shortened. Happiness only increases, by being shared”. Let us be the light, for each other, let us together light the world.